I have forgotten how fast i was with a gun. When every second count it is smart to have training. Do not do this without training and remember that the blade must Lock before it hit rope unless it may be injury for the fingers. Sorry for low quality video sound but it is not been altered in any way. I am a picture guy and not video. This is a type of rope that serrated edges are made for. This plain edge did it very well anyhow. Train with gloves before doing this, i have practised in my sit on top kayak for safety. I have tested what i believe are important at sea..Good luck and remember the Swiss Army Knives are made in the tradition and never for violence! If you look at the demonstration it is important that you are careful and use protection before you try. I know what it can take this blade. 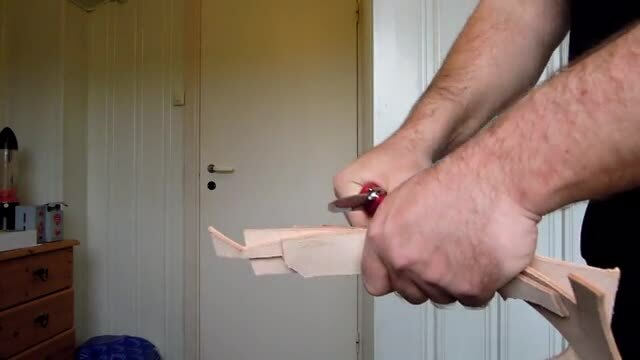 This blade has been tested on different types of rope much better than this on the videos. On many materials and on wood. All parts on this New Ranger has been tested rather hard. Remember that a clean and sharp knife is much safer than a dirty and dull one. In most cases force are never needed on knives. 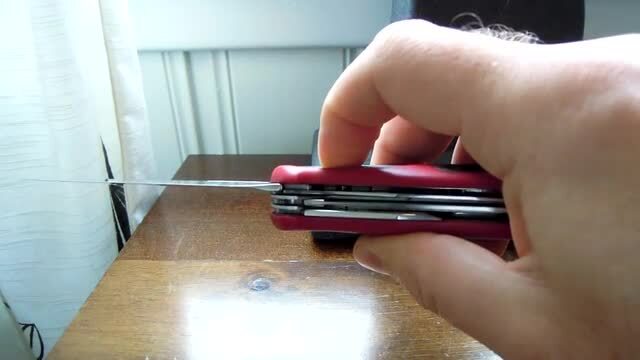 It is difficult and see in this video but the last 20% when opening the blade then the spring will lock and snap the blade into place. Like you find on slip-joint types. The spring tension is the same on mine like it was new. The Wenger knife will wear in some, it will be more comfortable after some use. That the spring resist the thumb and then let go the last 20% is not any discomfort because it is past the motion. I like this design alot because it is oposite of violence Products and made in the SAK tradition! It is funny that with this oposite philosophy it is a better safety knife than many. It is versatile! it is important that every knife is sharp, clean and oiled, a knife for safety and rescue must be so all the time. On the video is a technic if you cannot move the hand properly. It Works well. I am a big fan of blades that can be opened with one hand and with a locking mechanism. In some situations a folding knife with quality can be a better choice than a fixed blade knife. A folding knife can be carried in pouch or with a clip. In most cases a fixed blade would be better. I recommend reading my pages on rescue blades. The designated rescue blade would have a special purpose tip. An experienced person can get by with a plain edge Wenger SAK with the regular blade. In one of the videos you see that I fold layers of rope and the edge struggle some and force is needed if this is going to be cut fast. A serrated edge will outperform a plain edge some times. A SAK is an excellent knife for safety because you got some additional functions. The wood saw will cut any rope. Today there are many SAKs with serrated edge so it is no problem either. Please read my rescue blades pages! The Wenger knife is opposite in philosophy than any illegal knife, it is made in the tradition. It depends on training with a Wenger one hand opening knife and how fast you are. In most situations speed is not needed but rather a evaluative mind instead. five layers of quality leather so use caution and handle with care:) same New Ranger knife like before. The best designed SAK blade ever made. It is an Upgrade of the old steel used on the older Rangers, i guess HRC 56-58. Very easy to sharpen. This is why we are enthusiastic about the New Ranger knives.